This formulary is a list of drugs selected by Kaiser Foundation Health Plan of Washington—and approved by the Centers for Medicare & Medicaid Services (CMS)—that are covered by Kaiser Permanente Medicare Advantage (HMO) plans that include prescription drugs. Based on consultation with a team of health care providers, these prescription therapies are believed to be a necessary part of a quality treatment program. Drugs are classified into 6 tiers. Learn more about Part D coverage. 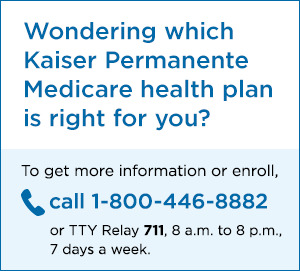 Please note: Kaiser Permanente health plans require prior authorization for certain drugs. Here is the prior authorization drug list (PDF) for 2019. Kaiser Permanente Medicare Advantage plans may add or remove drugs from the formulary during the year. The formulary on this page is current as of November 26, 2018. Generally, if you are taking a drug that was covered at the beginning of the year, we will not discontinue coverage of the drug during the coverage year except when we receive information from the FDA that a drug is no longer safe or effective. Complete information about these changes is included in the formulary documents above. If your drug coverage is ever affected by a change to the formulary, we will either tell you 30 days before the change or give you a one month supply when you ask for a refill. Kaiser Permanente Medicare Advantage plans cover both brand name drugs and generic drugs. Generic drugs have the same active-ingredient formula as a brand name drug. Generic drugs usually cost less than brand name drugs and are rated by the Food and Drug Administration (FDA) to be as safe and effective as brand name drugs. Kaiser Permanente will let you know about these changes through the Provision of Notice (PDF) (coming soon) or Explanation of Benefits, which will also detail all your pharmacy transactions and annual accumulations. Talk to your doctor about alternative drugs that are on the Medicare Advantage Part D formulary. Ask your doctor to adhere to rules about quantity limits and prior authorization. If you would like to ask for a drug formulary exception from Kaiser Permanente, you can do so via phone, fax, mail, or online.